What was once a welcoming and supportive reception for Syrian refugees in Turkey has turned to resentment and destitution. As the Syrian war has dragged on, Istanbul, Turkey's economic and touristic hun, has seen the population of destitute Syrians swell. As a result, the patience of the local population and aid from the government is wearing thin. While Istanbul has long been a hub for migrants traveling to and from Europe, Syrians have been trapped in Turkey, as it is almost impossible for them to obtain visas for onward travel to Europe, and many cannot return to Syria out of concern for their safety. Many now find themselves living in squalor with little hope or options for the future. "Life in Turkey is very hard, Syrians cannot work because they do not have the necessary permits and the only solution is to work illegally. There are children who work 15 hours per day to bring to their families a little money which is not even enough to buy bread. 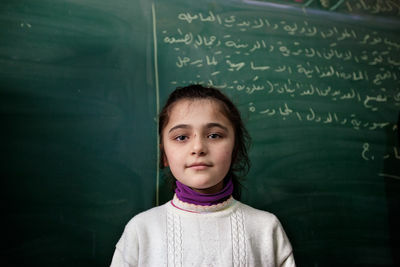 When the war is over I want to go back to Damascus, to my family, to my land." 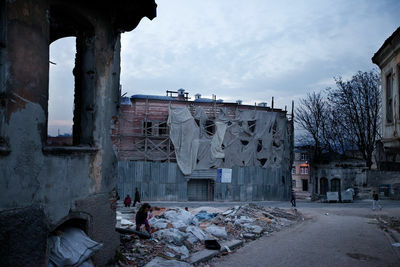 The Syrian community seeking shelter in Turkey numbers about 1.5 million people. 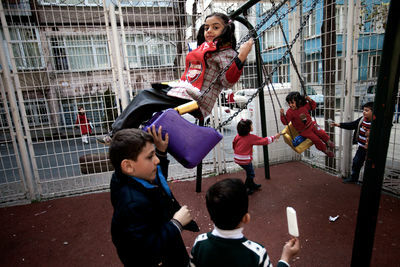 Syrian refugees try to reestablish their lives in Istanbul, looking to the longterm. Refugees come from different social classes. Those who can afford it rent an apartment in Aksaray for 1000Tl ($380) per month and share it with other people. Usually the richer refugees think about escaping to Europe by paying a smuggler, while others decide to stop in Istanbul and invest their money in commercial activities. After the trip to Istanbul, one of the main problems for Syrian refugees is the language. Some words from the Turkish and Arabic languages are similar, but, due to the nationalism, a dominant characteristic of many Turks, people who speak Arabic are often discriminated. 12 year old Mohammad was found on the streets of Istanbul by the owner of a Syrian restaurant. He and his brother were welcomed by the man, a former computer engineer who escaped the war, and started working as dishwashers in his restaurant. The two boys work 14 hours per day and sleep in a room behind the refrigerator in the kitchen of the restaurant. Those who cannot spend too much for the rent share small basements or cellars. Many Syrian refugees cannot work in Turkey because they do not have a residency permit. Anas, 24 years old, escaped from Aleppo and works as a tailor in Istanbul without any job security. He left his family in Syria and is thinking of going back there to fight against the regime of Bashar al Assad. 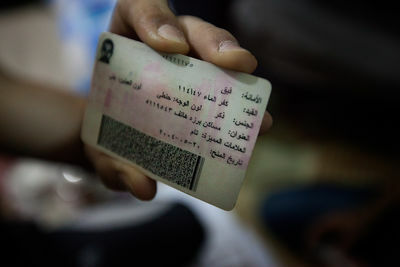 A Syrian refugee shows his ID card and describes his arrest and torture at the hands of the Syrian police. On the ID there is a number which indicates which district a person is from. Based on the district, police can often venture a good guess as to a person's religion. The person in the photo was arrested while coming back from University. According to him, the Police stopped him, checked his ID, and arrested him because he is Sunni. While the uprising in Syria has involved people of all religions and ethnicities, it is largely comprised of Sunni Muslims, who are also Syria's majority population. The Syrian community has founded many associations that help Syrian refugees in Istanbul. 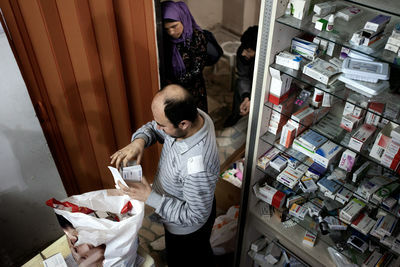 Near Aksaray, the Syrian Noor Association provides refugees with a doctor and a dentist. Some refugees suffer from post-traumatic Stress disorders, especially young people directly affected by the fighting. However, lack of access to psychological care is still a major problem. The Syrian Noor Association collects medicine in order to distribute them in the center or to send them every month to Syria. The Turkish Government allows them to do so, but does not help in any way. Everyday, many refugees come to the center to pick up clothes that the Association and the Mosque have collected for them. Families who flee from Syria usually leave all of their belongings in their homes and arrive in Istanbul with almost nothing. Syrian refugees who escape to Istanbul are usually Sunni muslims. Turkey is a predominantly Sunni Muslim country. 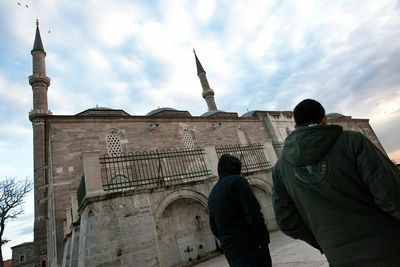 Politically, Turkey has been traditionally secular. However, the rise of Recip Teyyip Erdogan to power has changed this and Sunni Islam has begun taking a more central role in Turkish social life. In the beginning, Erdogan helped Syrians in the name of religion and to help generate more votes amongst the Turkish electorate. However, some Syria refugees feel that, while Erdogan is a good muslim man, he does not actually do much to help them. 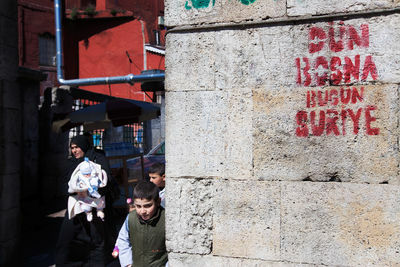 According to the UNHCR, Syrian children (from 0 to 17 years old) account for about 55% of Syrian refugees in Turkey. Many of them have lived through traumatic events and have witnessed war first hand. 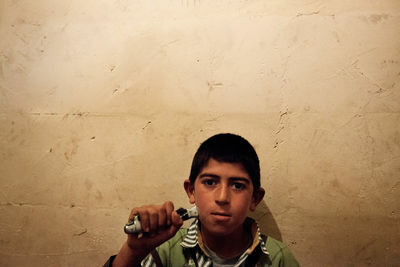 Some of them suffer from psychological disorders resulting from what they have witnessed in Syria. Several associations were founded by the Syrian community to try and help Syrian children cope with their trauma, but lack of access to proper care is still a major problem. One of the first things that the associations try to provide is education. 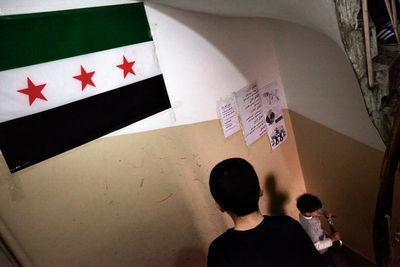 Children in this school continue to study according to the Syrian curriculum. Some books are re-written and passages praising Bashar al Assad are deleted. In this school, Turkish and English are also taught. "We came to your feast, Through your celebration we are asking you, why now do we not have any feast? O World, my land is burned, my free land is stolen. Our sky is dreaming, asking days, where is the beautiful shiny sun? Where are the pigeons flocks? The flag used by the revolutionaries is still hung in all classrooms. 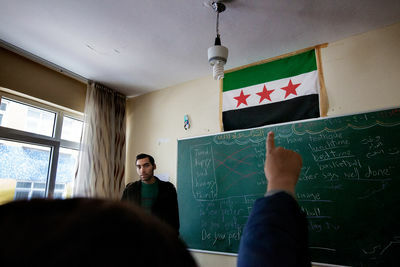 Some schools publicly took a stand in support of the Syrian revolution, hanging the flag of the revolution on their walls. Middle class Syrians are able rent a flat for 300/400Tl (125/165$) near the neighborhood affected by the Erdogan's restructuring plan. 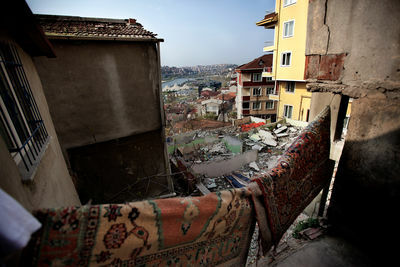 The plan was set up to re-build some areas of Istanbul. These houses will soon be destroyed to make way for more expensive, modern high rise buildings. 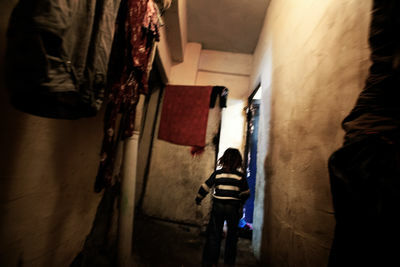 Nahla and her family live in a small house with two bedrooms and a kitchen. There are ten people leaving there with seven children. 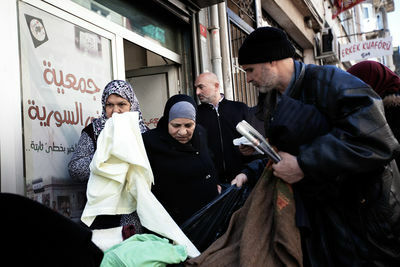 All of the families fled Damascus. The men of the family work as carpenters or bricklayers to raise the money to pay the rent and food. 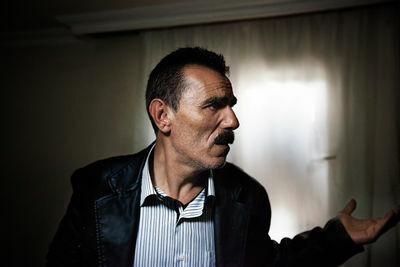 Sivan, a 45 year old man from Qamisli, has been in Istanbul with his family for five months and he cannot find a job. He is Syrian-Kurdish and this makes it more difficult to find work in Istanbul. He says he came to Istanbul by bus. Due the fact that he cannot find a job, he is not able to pay his rent. His rent is three months overdue and the the owner of the flat in which he lives in wants to force him out. He does not know where he and his family will do in future. 16 year old Omar is from Hasakeh. He and his family came to Istanbul on foot, helped by a smuggler, after paying 200$ per person. He does not go to school and works 14 hours per day as a button sewer to raise 150 Tl (65$) per week to help pay the rent of his house. Farah comes from Damascus and has been in Istanbul for one year. When the war started in Syria she was pregnant. Her husband came to Istanbul and found a job and is able rent a house, which they share with another family. In this neighborhood, far from the touristic center of Istanbul, Turkish people are more polite and help Syrians by giving them food. The Mosque helps refugees by giving them bread and rice. 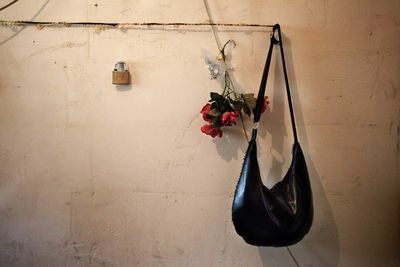 In the poorest neighborhoods, refugees can find a small room for 100/200Tl (40/80$)/month. Sometimes refugees occupy empty houses. 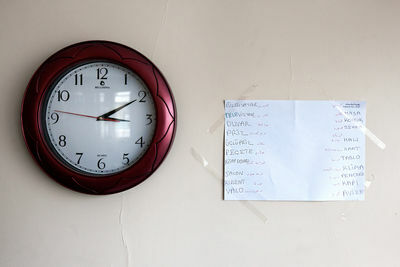 Life here is very hard in these situations because the rooms usually do not have heating and running water. The situation is very bad and they wonder why nobody does anything. The hygienic situation in the poorest buildings is bad. There is no heating or drinkable water. 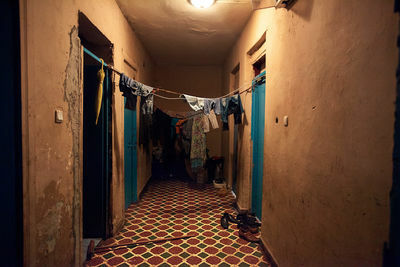 In this building, every family rents a room no larger than 25 square meters and usually has only a small window. The restructuring plan of Erdogan aims to destroy this old building and erect a new one that Syrian refugees could not afford rent. Often families have been forced to separate due to the war. Many mothers and wives have sons and husbands who fight in a war. Women are often left to take care of the children and fend for themselves while the men remain in Syria. Some of these woman are forced to walk several kilometers everyday to pick up the aid distributed by the associations. 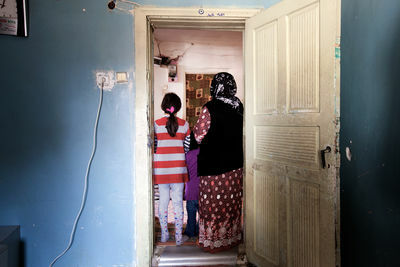 Syrian Women in need often complain that after an initial effort on behalf of both the Turkish government and the international associations, they were left to their own devices. 35 year old Mahmoud (not his real name) escaped from Aleppo after being wounded and having surgery on his stomach. He came to live in a room with his family in Istanbul. He cannot work or walk very well. "We were escaping from Aleppo and a rocket fell close to the car. Splinters exploded and struck me in my stomach and the leg. When I arrived to Turkey, in the center, they fixed my wounds. Thank God I survived, but now the situation is very bad, we are left to ourselves and we don't know what the future holds. I think I want to go back to my country when the war ends, I have my land in Syria. Inshallah." 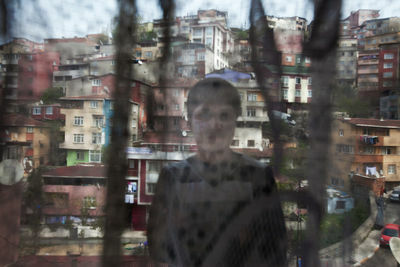 Children who cannot afford to go to school wander Istanbul's city center seeking handouts or finding illegal jobs where they are exploited. Many children work up to 14 hours per day for little pay. The situation for Syrians in Turkey is still precarious. Since 2014, several demonstrations against Syrian refugees have taken place. At first welcomed by Erdogan, Syrians were left to their own devises. Those who can, try to immigrate and seek asylum in Europe. However, an increasing number of Syrian refugees are forced to live in limbo while they wait for the war to end and return to their country.